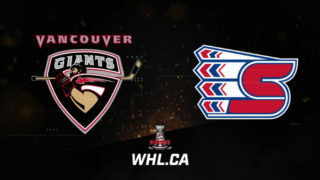 Calgary, AB – Leading up to the 2014 NHL Draft at the Wells Fargo Center in Philadelphia on June 27-28, WHL.ca and WHL Web TV, will highlight WHL players who are highly ranked by NHL Central Scouting leading up to draft day. This week’s featured WHL player is Red Deer Rebels’ mobile, two-way defenceman Haydn Fleury. Haydn Fleury completed his second full season in the Western Hockey League with the Red Deer Rebels. The Carlyle, SK, native was a top performer for the Rebels this past season, netting eight goals and 38 assists for 46 points along with a team-leading +15 rating in 70 games. 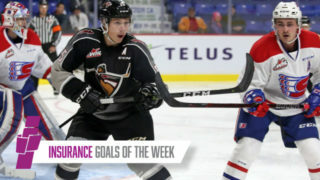 His 46 points placed him fourth on the Rebels in scoring while tying him for 17th in scoring among all WHL defencemen. An excellent skater with plenty of size, hockey sense and puck-moving skills, Fleury has the tools to one day become a very effective defenceman in the NHL. At 6’3”, 198-lbs, Fleury is an imposing player who can play a physical game and use his size and reach to neutralize opposing forwards and win battles in the defensive zone. For a big player, Fleury skates exceptionally well. His fluid stride, agility and speed help him carry the puck up the ice, join the rush and get back to the defensive zone in a hurry. Fleury also has a good mix of hockey sense and puck skills, making him an offensive threat. He can move the puck up the ice and in the offensive zone, and boasts a heavy, accurate wrist shot and slap shot and a quick release, making him a threat to score or to generate chances off rebounds and deflections. 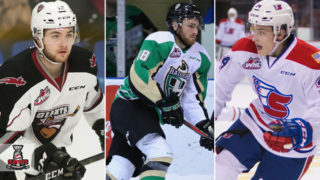 “His biggest strength is his skating ability…being able to carry the puck and get back into defensive position quickly,” said Rebels’ head coach and general manager Brent Sutter. “At the NHL level, you have to be able to move, you have to have agility, and, most importantly, you have to be able to make plays, make decisions quickly and move the puck at a high pace, and I think Haydn has continued to improve in those areas,” said Sutter. Having played a lengthy NHL career and having coached at the NHL level, Sutter knows a thing or two about the make-up of many of the NHL’s top defencemen. While Fleury possesses the raw talents and attributes of a potential Top-4 defenceman in the NHL, Sutter says the most important developments Fleury will make are the mental ones. 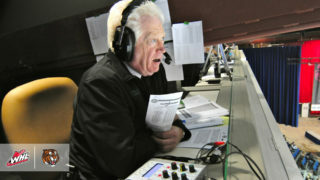 “He has all the talent, so it’s just about him continuing to learn and grow…it’s about learning the game,” said Sutter. “When he does have the puck, sometimes it’s about making the simple play that’s the right play. “When you’re playing AAA Bantam or AAA Midget, you can get away with trying to do too much. But, you can’t do that at the Major Junior level, so this is where you learn to play that pro game, because when you get to the NHL, you’re not going to get away with a lot of the things you used to do. “Haydn has come a long way with his decisions with the puck, him picking his times to rush the puck, and making smart plays in the offensive zone off the rush at pace,” he said. Selected by the Rebels in the second round, 43rd overall, in the 2011 WHL Bantam Draft, Fleury has already enjoyed success at the international level. 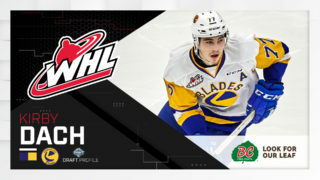 He played for Team Saskatchewan in the 2011 Western Canada Under-16 Challenge Cup, and also played for Team West in the 2013 World Under-17 Hockey Challenge. 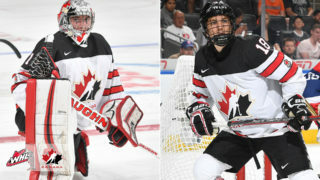 Fleury has twice played for Canada’s Under-18 team, winning Gold at the 2013 Memorial for Ivan Hlinka tournament, and capturing Bronze at the 2014 IIHF Under-18 World Championship. Fleury also played for Team Cherry in the 2014 BMO CHL/NHL Top Prospects Game. Did you know…Fleury was named the Top Defenceman at the 2014 U-18 World Championship…Current NHLer and former Portland Winterhawk Brendan Morrow used to babysit Fleury…Fleury models his game after NHL defenceman and former Medicine Hat Tigers star Jay Bouwmeester.